My Cardboard Life » Recyclost books have arrived! The Recyclost books have arrived. If you’ve pre-ordered a copy I’ll be sending them out right away so expect to see it soon. Thanks so much for ordering it! I’ll be randomly selecting the winner of the knitted intern TONIGHT at 11pm GMT so there are a few hours left to pre-order and be in with a chance of winning it. Pre-order here. 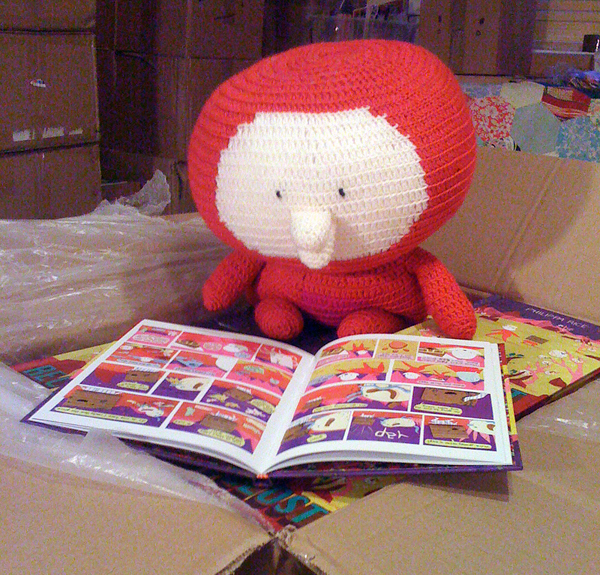 The knitted intern winner has now been chosen and pre-orders are now normal orders! Woo, got mine today with button and cards and a Pauline-head! Very nice, thanks. Going to put a safety pin through the Pauline-head now!